Michael Owen is a striker for England and Manchester United in the English Championship. Owen burst onto the scene with his goals for Liverpool in 1997, and has been scoring for fun ever since. Having recovered from a cruciate ligament injury, Owen found he wasn’t as quick as he once was, but has the football brain, vision and technical ability to be in the right place at the right time regardless. Michael Owen was born on 14th December 1979, in Chester, England. His father was a professional footballer, most notably for Chester City, and encouraged a young Michael to play as often as possible. He grew up just inside the Welsh border, and set all sorted of goalscoring records in both his School and Saturday league teams. Because of his clinical finishing and ability Owen was chased by all the top clubs, including Manchester United and Arsenal, and opted to sign for Liverpool, even though he was an Everton fan! Liverpool enrolled him at the national academy, where he played with a young Alan Smith, but joined up with the Liverpool first-team after he had finished his GCSEs. 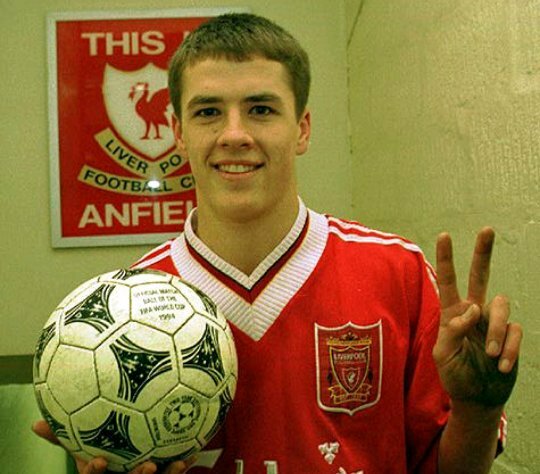 Michael Owen first rose to prominence with Liverpool with a hatrick against Manchester United in the 1996 FA Youth Cup Final. He was offered a professional contract on his 17th birthday, but had to wait until the end of the 96/97 season for his first team debut, in which he started his career with a well taken goal against Wimbledon. With Robbie Fowler injured for the next season, Owen became the team’s first-choice striker, aged just 18. His sensational performances, embarrassing much older and wiser defenders with his clever runs and instinctive finishes, ensured that he was soon drafted into the England team. He won the PFA Young Player of the Year, and scored 18 league goals in his first impressive season. Owen was one of the key-men for the next 6 years at Liverpool, winning the fans over with his unique brand of fast and furious football. He was one of the team’s best players as they romped to 5 trophies in the 2001 season, including the FA and League cups, and UEFA Cup. The prestigious European Footballer of the Year Ballon D’Or Award in 2001 confirmed Owen as one of the World’s very best strikers.